The Key by Pauline Baird Jones! Ms. Jones is no stranger to awards as her well-crafted stories have won many. Her latest entry, The Key, is full of suspense, action, humor, intrigue, and yes - a love story. The book is so well written and such fun to read, I can't imagine a reader who wouldn't enjoy this book. Congratulations to Dream Realm Awards judges for an excellent choice and a big thank-you to Ms. Jones for another great story. 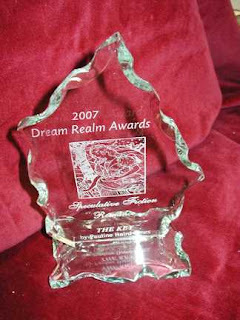 This is the eighth annual event for Dream Realm Awards which were created "to recognize excellence in science fiction, fantasy, and horror in electronically published books." For a complete list of this year's winners, please click here. If you are interested in meeting this award winning author, check out the release party for A Death in Texas on October 10 at Katy Budget Books in Katy, Texas.